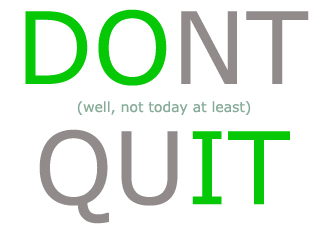 Do not quit your day job. At least not yet. One of the most common questions I get asked is how I became a successful full-time freelance blogger. The truth is I’m NOT a full-time blogger. In my experience there are many benefits to keeping your full-time job while setting out on a path to become a freelance blogger. Here are a few things to think about before quitting a job and embarking on a freelance blogging career. Most people do not enjoy being ‘just a number’ at a corporation. Most people hate having to play political games. But that’s often the exchange for health benefits, vacation time, and other perks that are part of your employer’s overall compensation package. When looking to quit a job and become a freelance blogger, you need to figure out how much you can charge for your services AND how much money you need to make. While money isn’t everything, it is prudent to be confident that your blogging can make up for your loss of salary — and the additional benefits you will be losing. One of the reasons I encourage aspiring freelance bloggers to stick with their full-time jobs is to give themselves options. Putting yourself on a dual track, one where you are growing at your full-time job AND growing as a blogger, is the best of both worlds. Sure, it can be a struggle to manage your time efficiently, but with some hard work and structure, it’s possible. Maximizing your time at a full-time job to grow your blogging empire is one of the secrets of success. There are pockets of time everywhere if you open your eyes to them. There are ways to use your commute, lunch hour, and other ‘dead’ time zones to blog. Writing for clients is very different than writing for your own blog(s). Each client has a different set of demands, a different set of expectations. You might not enjoy blogging as much when presented with difficult personalities, paperwork (invoicing), deadlines, etc. I recommend you test the waters and build blogging relationships for at least a year. I know that sounds like forever, especially when you are dreaming of walking away from a dead-end career. But building your dream career and working for yourself is not for the impatient. This is another reason why putting yourself on a dual track is smart. you can show off to potential clients. It will also make you a better blogger. – Be proactive when it comes to getting jobs. If you take anything away from this blog post on your quest to be a freelance blogger, make it this bullet point. 99% of your freelance blogging competition will be responding to ads looking for bloggers. However the best blogging jobs, are often the ones that aren’t announced anywhere. In fact, often, they are with businesses that have been thinking about blogging, but haven’t started one yet. Don’t be afraid to pitch for the blogging gigs you want and attempt to create your own. – Have a central place to display your blogging work. Most of the bloggers I know write for more than one blog. This makes it important to have a single website/feed/blog where you can put your best work on display. You can’t expect potential clients to click through dozens or hundreds of blog posts. Take the time to create a resource that puts your best work under one roof. You should also create a blogger resume. It should go without saying, but it’s of paramount importance to be responsive to potential client inquiries. I have found that the sooner you respond with a personalized reply, the better the odds of getting hired. If you are dreaming of becoming a freelance blogger there is no better time to start. Just use caution before leaving your day job behind.